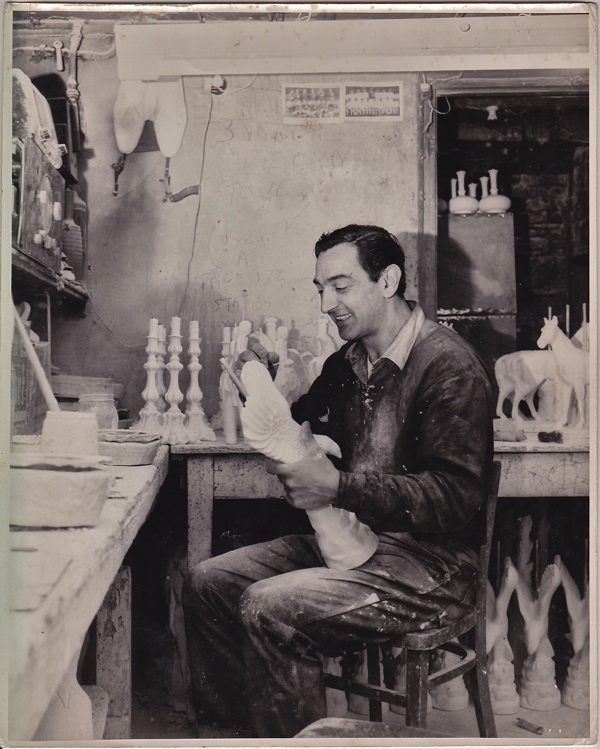 This is Bruno Besagni, pictured in the nineteen fifties, with one of the finely painted casts that he made in his factory, Bruno’s, utilising the expertise that he first acquired in Clerkenwell at the age of fourteen. 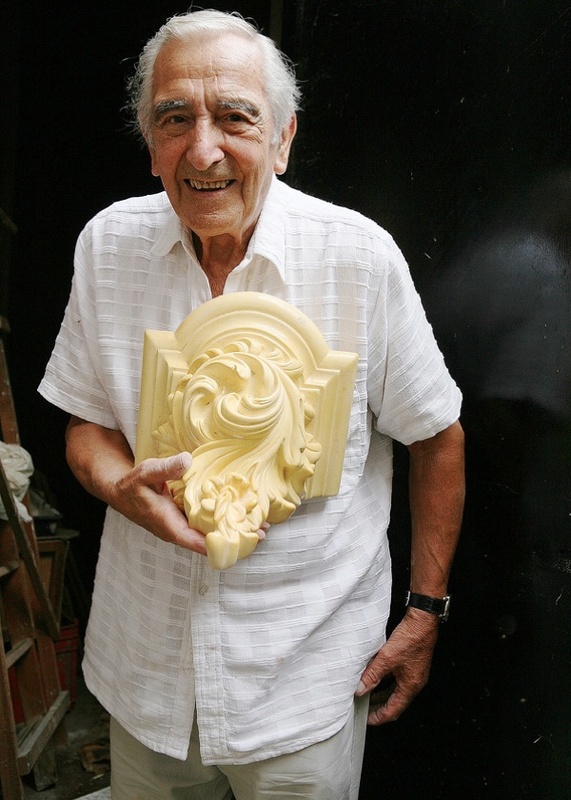 Bruno showed me a similar lamp in his living room and, when I admired it, he gestured aloft with whimsical delight, directing my gaze overhead and there, overarching everything, was a flamboyant ceiling rose of acanthus leaves that he also made, using one frond he retrieved from broken plasterwork in an old hotel. 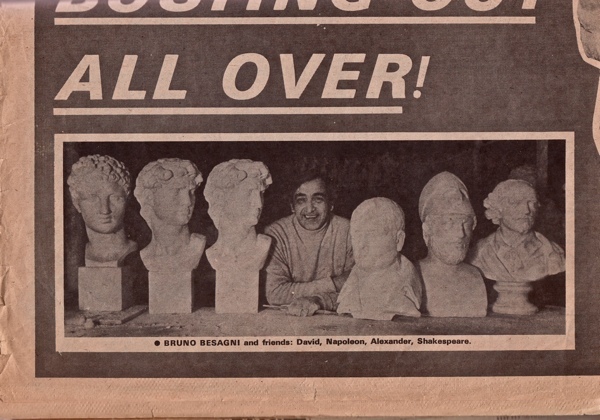 Moulding and painting statues became Bruno’s life, pursuing the traditional Italian technique which has its origins in religious art. 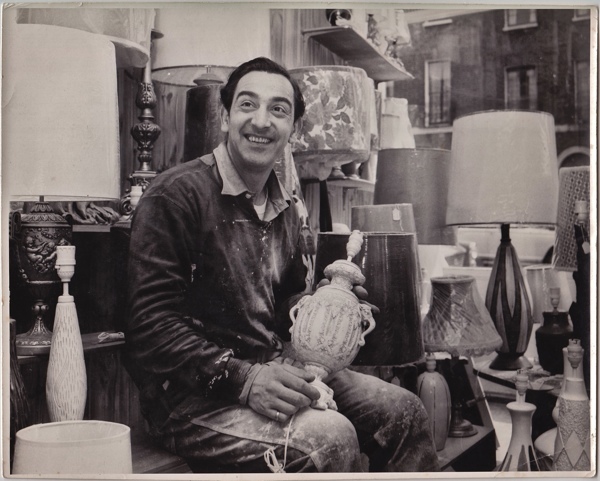 In fact, alongside his career making lamps and figurines for sale, Bruno also made and repaired devotional statues for churches, including the painted effigy of Our Lady of Mount Carmel carried in the Italian Parade in Clerkenwell each year. 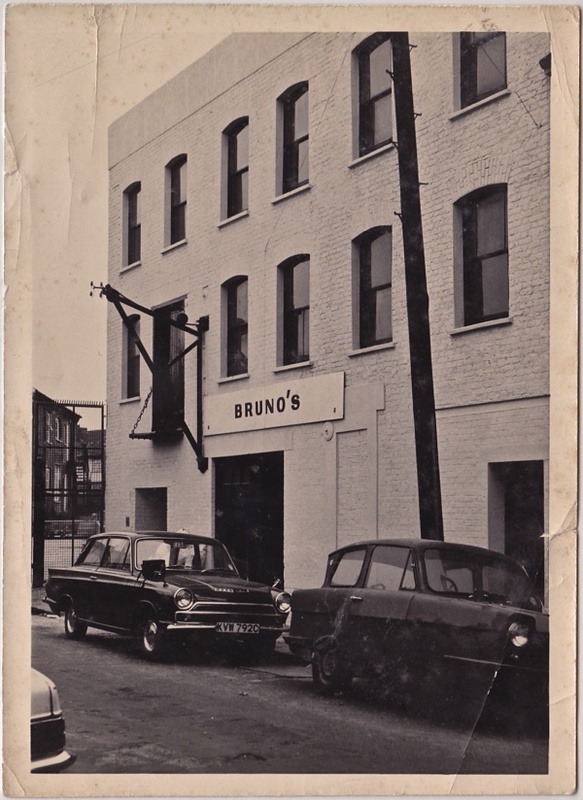 There is a certain kind of magic, conjuring such animated figures out of base materials, painted in lifelike colours and highlighted with gold, and it is this magic that sustained Bruno throughout a long career. “Being Italian, my mother said, “You’ve got to go and work in a cafe or a restaurant, at least you’ll eat.” I tried it for a while, but I never got on with it. 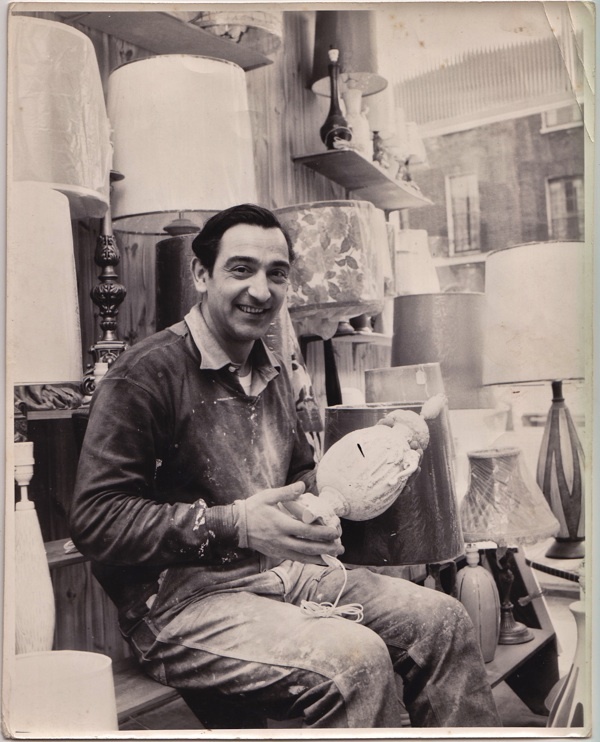 I got a job as artistic sprayer at the factory in Great Sutton St belonging to Giovanni Pagliai who came from Lucca in Florence where they make all the traditional statues. I took to it at once, I was fairly artistic and all my life I’ve been involved in art. I worked there for a couple of years from fourteen to sixteen, that’s where I met my wife Olive. When the war began they were all imprisoned. Most of the staff were Italian, and one day a squad car pulled up and arrested everybody. They were “undesirables,” they came under section 28(b) – you were imprisoned but you could have food sent in. 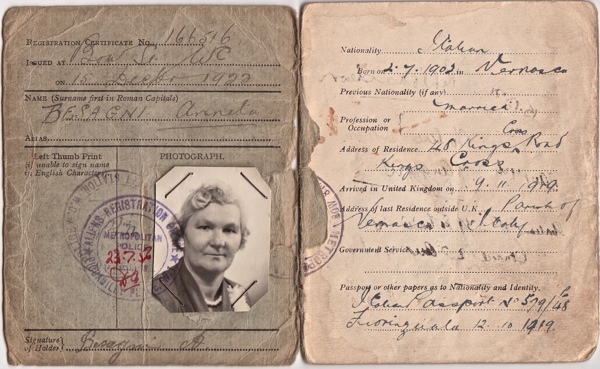 As my father was born here, I was a British citizen, so everybody but me got interned. After that, I did all sorts of jobs, chasing money because we were so poor. I should have listened to my mother and gone into the restaurant business. 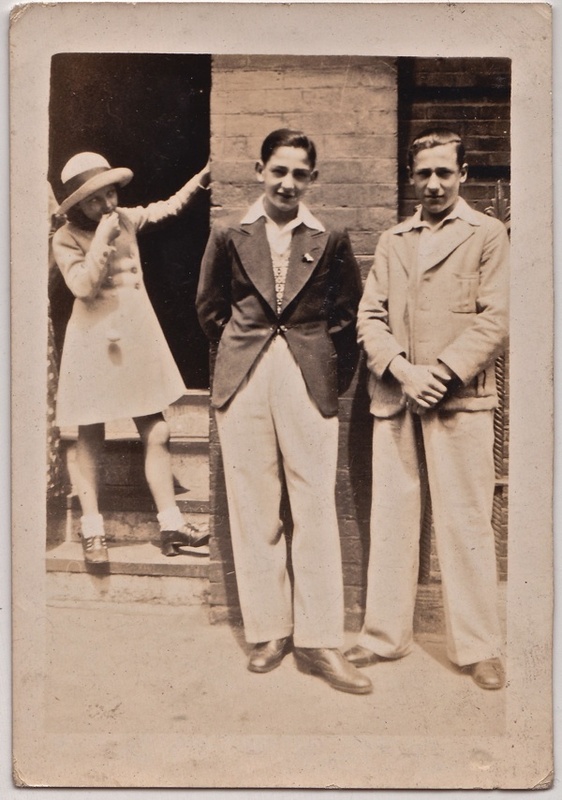 I was born in 1926 at 48 Kings Cross Rd next to the Police Station, and we moved to Victoria Dwellings on the corner of Clerkenwell Rd in the Italian Quarter, when I was very small. Down “the hill,” everybody ducked and dived, and I had that education, but all I ever wanted to do was to play football and run. 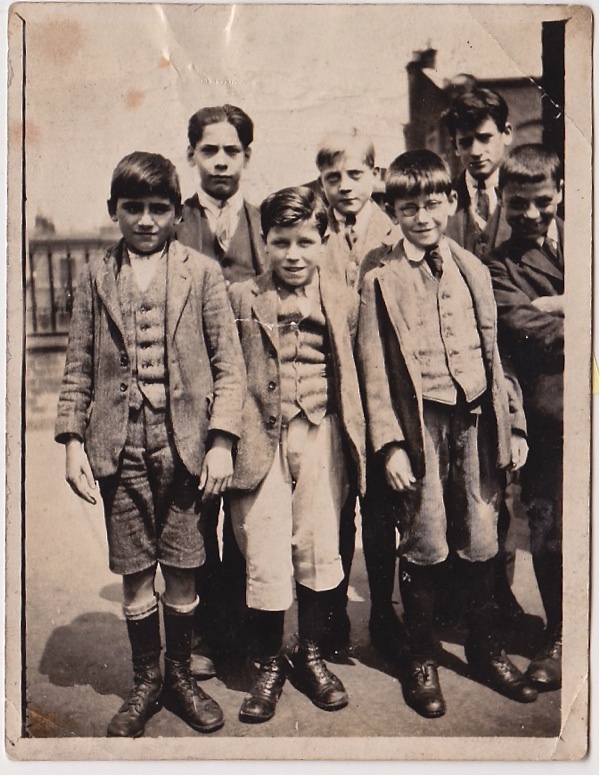 We were babies really, sent out to work at fourteen when we left school, earning twelve shillings and sixpence a week, and giving ten bob to your mum. 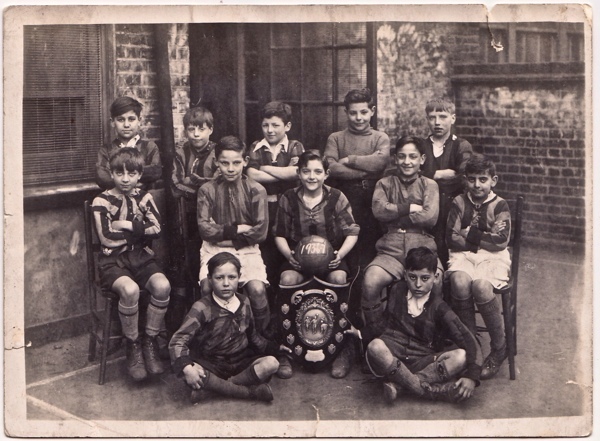 It was a poor wage yet I enjoyed it, there were nine of us in the family then and we were all happy. I ran away from there after a couple of years, because I was worried about my mother and the bombs were still dropping on London. 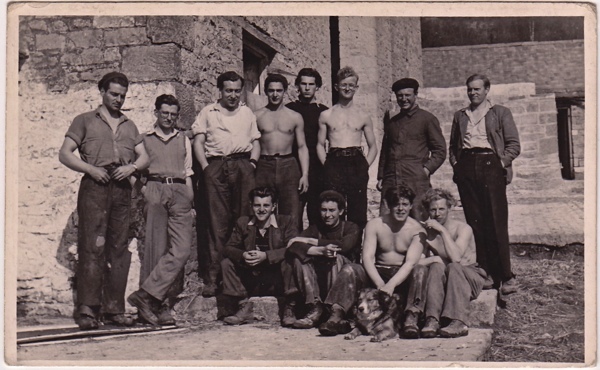 They caught up with me and said, “You’ve got to do something.” so I worked in a munitions factory in Ruislip. I was still trying to chase money. I was signed by Fulham, but footballers got no wages in those days and I couldn’t stand around acting the star when I had no money. The war was coming to an end and somebody said, “I’m going into the statue business,” so we started a little company in Camden Town. We used to open the window for ventilation when we did spray painting, and once the neighbour came round covered in gold paint! For a few years it went fine, but we was becoming villains, we were getting raided for our stock by the police. The purchase tax on items was 125%, so we didn’t have chance – until we learnt that some articles had no tax, like fruit bowls. They weren’t being made yet they were on the invoice! It was our little ploy. Everything was plaster, we made elephants, dogs and cats. After the war, people had money to spend but nothing to buy so they queued to buy these figurines – all this stuff was rubbish! Then I moved into making statues, I wanted to be more classy and artistic. I called myself a reproduction artist in the end, because I not only cast the statues, I painted them too. 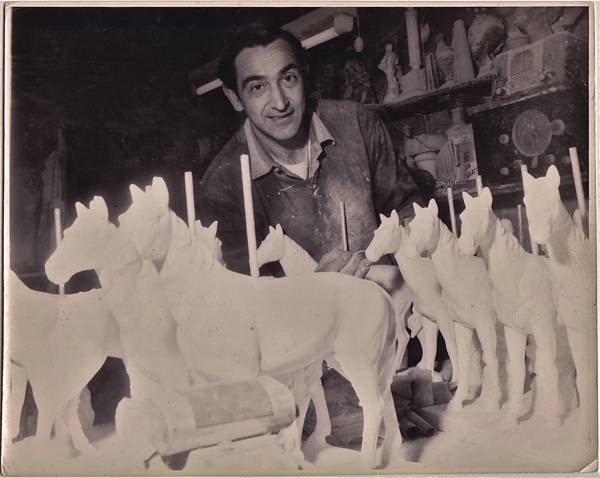 I set up on my own, at first on the Caledonian Rd and then in a factory in Stratford, and I made proper statues. I had staff, there were about four of us, and we made Beethoven and Shakespeare. I’ve still got the mould for Shakespeare in my wardrobe, I don’t know why. Cupid, Hermes and Michelangelo’s David were also popular. 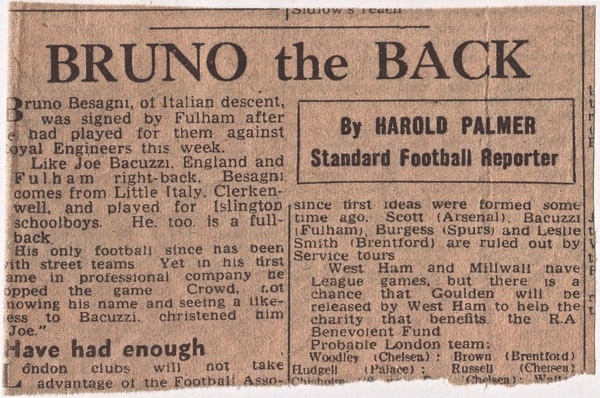 Remarkably for one in such advanced years, Bruno still exuded the irrepressible vitality that characterised him in photographs spanning eighty years – and it was this brave magnanimous spirit, combined with a passion for football and running, that carried Bruno Besagni through the ups and down of life with such enviable panache. 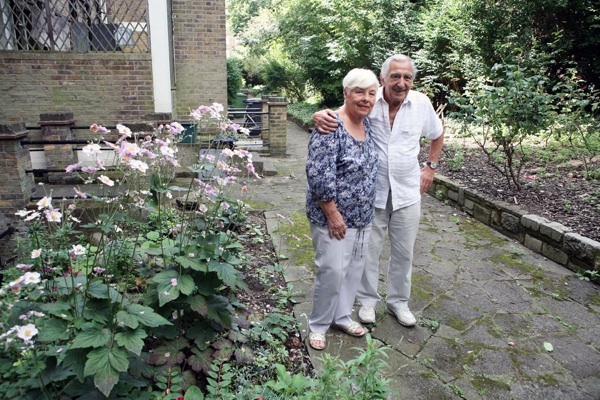 Thank you for recounting the story of Bruno Besagni and his wife Olive. Lives lived with love and lustre. 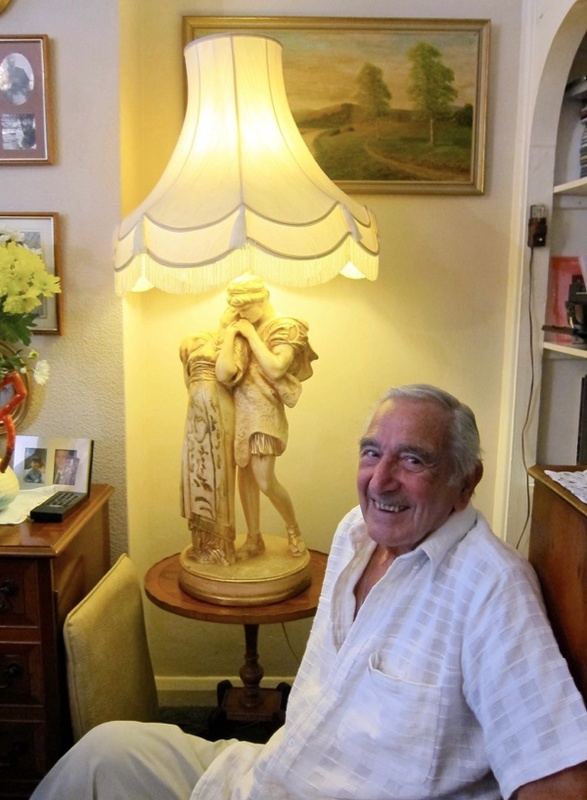 What a wonderful, human story- provides much to reflect on…. I am thrilled that two such simpatico people found one another and spent a whole lifetime together. Brava and Bravo! 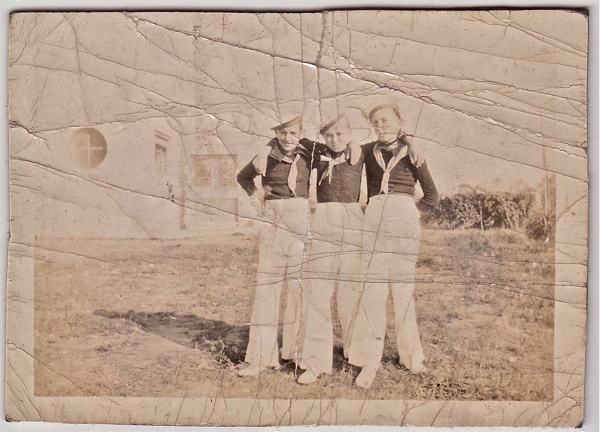 “the boys of Back Hill” — Now that would be a photo that would have a place of honor on my mantle. Never out of sight, always good for provoking one more smile. A wonderful Life Story of two wonderful People! Olive & Bruno Besagni — R.I.P. 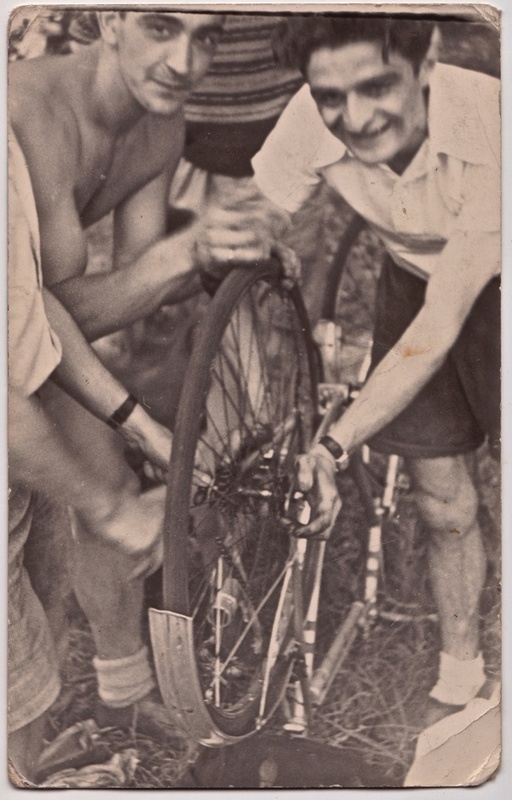 It was terrible the way that Italians were imprisoned during the war. 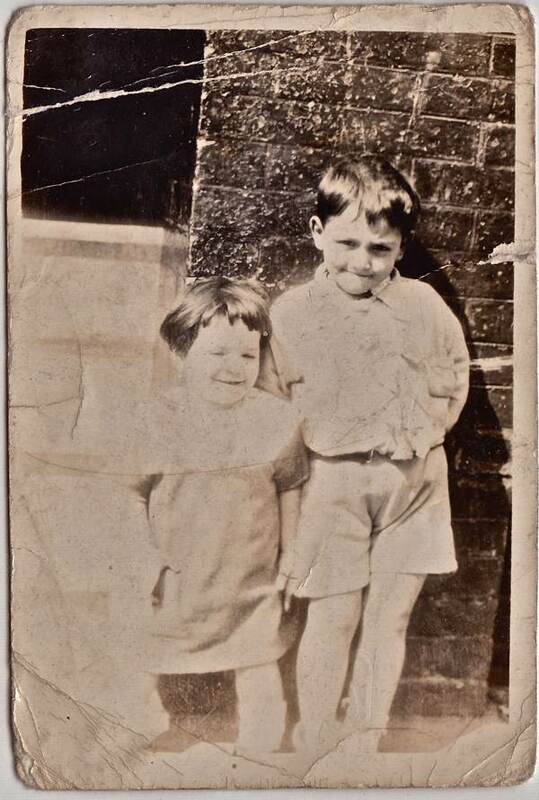 As a boy I used to visit my grandparents in our shop in Roman Road . 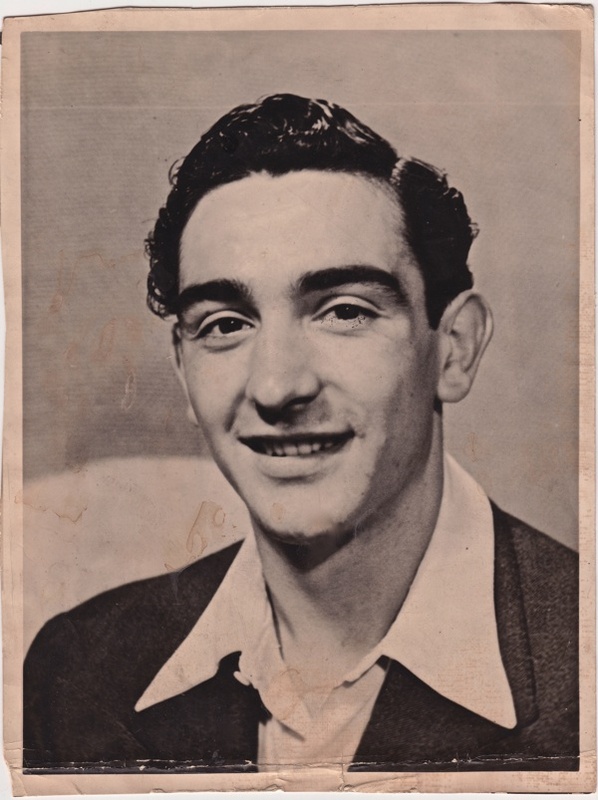 Next door was George Gargano who ran a cafe and sold ice cream,, he was a lovely man, I called him Uncle George and always had some ice cream from him. 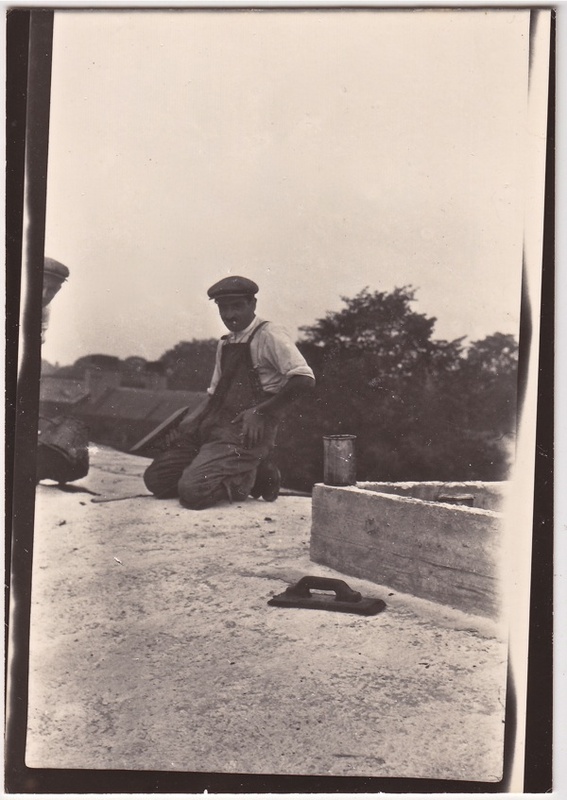 He was interned during the war and died there of a broken heart.